The report outlines some of the ways fiber infrastructure also helps local banks. In addition to providing connectivity to customers for typical day-to-day services, farmers often need high-speed connections for commodities and livestock sales, and access to global markets. Additionally, when students in the region have access to educational opportunities on par with their urban counterparts, they are able to increase their earning potential and stay in their community, strengthening the economic potential of rural areas. 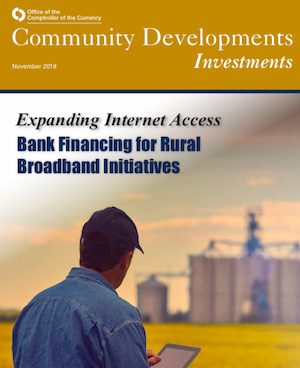 The report also explains that banks can finance broadband infrastructure projects as a was to support Community Reinvestment Act (CRA) programs. Permanent financing through the U.S. Small Business Administration 7(a) Loan Program. Construction financing, working capital, and other short-term loans. New market tax credits financing. As part of the report, the OCC includes and in-depth article on the Community Reinvestment Act (CRA) and how it has come to be integrated into rural broadband investment. The report also provides basic information on the rural/urban digital divide, the broadband standard of 25 Megabits per second (Mbps) download and 3 Mbps upload, and common definitions and acronyms one might encounter in broadband research. For those from the finance industry who might not be familiar with tech jargon, the report offers enough to get started in understanding what they need to know to conduct further research. The OCC report also offers both detailed and summarized examples of some of the most famous and lesser known networks and offers information about financing used to deploy them. The report touches in Chattanooga and Noanet in Washington and offers an extensive case study on south central Minnesota’s RS Fiber Cooperative. Detailed coverage of a local bank investment in Foley, Minnesota, and national bank investments in an Appalachian Ohio, Alabama, and tribal Alaskan projects provide varying perspectives. For more on RS Fiber, be sure to check out our 2016 report, RS Fiber: Fertile Fields for New Rural Internet Cooperative and our extensive coverage of the project.